Local records office is an organization that supplies interested homeowners and buyers with reports about the communities in which they live or hope to live. These reports include information about crime rates, schools districts and any other information that could be helpful when choosing to buy or sell a property. Being that this group aims to help house hunters to find the best home possible, and homeowners maximize the return on their real estate investments, they were interested to hear that the prices of Manhattan homes recently rose due to a shortage of apartments for sale. According to a recent article released by CNN money entitled “Manhattan home prices rise amid few ‘for sale’ signs,” homes within the Manhattan community have dramatically risen over the past few months. In the article, several big time New York real estate brokers blamed a shortage of inventory as the cause of price spike. Apparently, the current number of “for sale” apartments has not been this low since early 2005. This has caused real estate in the neighborhood to become a hot commodity, and according to Local Records Office professionals, this is exciting news for anyone who currently owns a home in the area. Additionally, the city’s new construction projects seem to be targeting wealthier Americans, pushing prices to even greater heights. At least for this season, Manhattan us truly in a seller’s market. The price for a Manhattan condo rose from $820,00 to $865,00 in the length of one quarter this year. That equals out to an impressive 5.4% rise. When compared with the dropping percentage of available listings, it is no wonder that affordable real estate in Manhattan is in high demand. However, the term affordable is also being redefined as wealthier Americans are being targeted as the potential residents in New York, who claimed that the homes being built in Manhattan are pinpointing the wealthiest 10% of buyers as future residents. Miller claimed that land on the island is becoming so expensive that developers need to build extravagant homes in order to make any profit from the project. These projects are being built for the purpose of becoming luxurious high rises too houses the country’s wealthiest business tycoons and other lavish-seeking individuals. One new condominium building near Carnegie Hall sold two penthouse duplexes at between $90 million and $100 million per unit-some of the most expensive real estate ever sold on the island. And according to the professions at Local Records Office, this type of scenario is a dream come true for current homeowners on the island. One man told Bloomingber.com that he recently sold a two-bedroom condo that he bought in 2010 for $1.58 million, for $2.5 million this past May. What’s more? Far from an anomaly, and it’s projected that this flux in demand will serve to help homeowners who live around Manhattan, as well. As options within the city of Manhattan dwindle, those hoping to find a Manhattan town home where they could raise a family are much better off searching in other areas like Brooklyn. This trend will greatly benefit current homeowners in that part of the city, as Brooklyn is only just behind Manhattan in terms of limited real estate. To the Brooklyn homeowners delight, expensive family homes are now being purchased in areas of New York that were previously exclusively inhabited by the less affluent. Trends such as these are precisely the reason why homeowners and buyers need the service that only Local Records Office is able to provide. When neighborhood faces changes, individuals may have only community reports to rely on to indicate whether they are planning on moving into a bachelor’s dream town or a family friendly neighborhood. If you already know which neighborhood you’d like to live in, NYC.org recommends finding a real estate broker in the area to gain access to the best available apartments. Local Records Office also recommends that potential homeowners visit their prospective property multiple times before making an offer. While it is easy recognize a home home’s value in terms of bedrooms and fixtures upon the first visit with a realtor, it is also important to pay attention to the neighborhood surrounding the house or apartment. By visiting the area at different times of the day, you will be able to observe other important factors such as traffic patterns or noisy neighbors. It is also a good idea to visit the property during different days of the week so you see the difference between weeknights and weekends life in the area. Especially in Manhattan, the environment could significantly change when tenants do not have work in the morning. At the moment, Manhattan apartment owners and buyers are in a precarious situation for another reason. 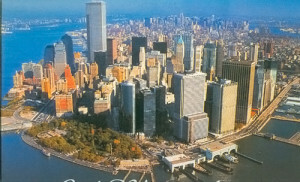 During the real estate market crash, prices in Manhattan dropped 30%. Now, however, they are rebounding and have reached the market peak in the second quarter of 2008, when the average Manhattan apartment was valued at $1.025 million. Additionally, available apartments don’t stay on the market for long, which is a blessing for sellers but a curse for buyers. Brown Harris Stevens and Halstead property’s report stated that in 2013, it takes an average of 111 days to find a buyer. This is 14 percent faster than 2012. Additionally, buyers may be wise to beware of a potential rise in mortgage rates later this year. While the rates are still relatively low given the jump in housing prices, fixed mortgages rates did come up. At the end of June, the rate had experienced its biggest one-week increase since 1987 when it climbed from 3.93% to 4.46%. This occurred after the Federal Reserve had suggested it might pull back on the economic stimulus program. The good news for buyers is that a rising mortgage rate may keep property prices from reaching insanely high prices. With demands so high and supply so low, buyers may feel pressure to jump into the first available apartment. While there is no guarantee that a favorite Manhattan condo won’t be snatched up quickly, all thoughts about buying or selling should enlist the help of Local Records Office team first.